and especially the people of Iran. I also want to thank you for the tribute to one of my oldest friends, the mentor senator John McCain, who I always called my captain because I met him in 1979 when I was a major in the marine core and he was the captain in the US navy and was the head of the Navy Marine Corps Senate liaison office on Capitol hill. I can tell you that his passing is a national tragedy and we’ve lost the voice for freedom, for tenacious devotion for freedom that is a message that will live long amongst all of us because of the power of his message and the strength of his convictions. Ladies and gentlemen, over the years I’ve had the frequent privilege of addressing members of the Iranian American community whose friendship and goals, I treasure and value, sharing time with you is always very special opportunity. I deeply appreciate your hospitality in our common interest for a more peaceful, more prosperous future for Iran. The Iranian people, the Middle East and the world over. Today, as was the case in 2010 when I left my post as national security advisor, the Iranian regime remains mankind’s most existential threat to peace and stability. I use the word existential because it strikes very much as our collective existence by its unrelenting behavior to undermine our values, our freedom and our prosperity. You know the role and the roll call of infamy better than I do. It’s a regime that seriously violates human rights, UN Security Council resolutions and international law. 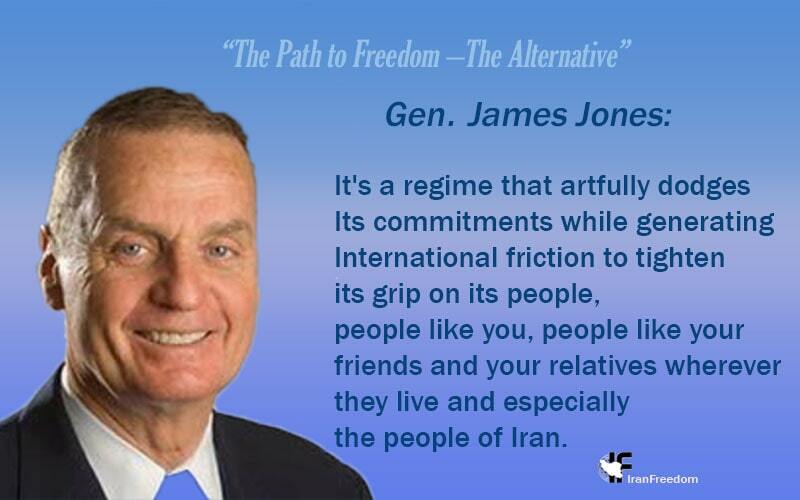 It’s a regime that artfully dodges its commitments while generating international friction to tighten its grip on its people, people like you, people like your friends and your relatives wherever they live and especially the people of Iran. This is a regime that rejects the right of Israel to exist and continues to actively undermine the Middle East peace process with no sign whatsoever of letting up. Tehran remains the chief antagonist of democracy and liberalization across the Middle East, where a better future for millions of people still struggles to emerge, and we see the regimes aspirations a regional hegemony a graphically on display in countries like Syria, Yemen and Iraq. Yemen hopes to keep the Gulf community embroiled in Shia Sunni conflict and in Syria to preserve its proxy state as a permanent base for regional troublemaking and international terror. Among Tehran’s most coveted objectives is establishing a long desired land bridge from Tehran to Beirut, Iraq and Syria as a platform for spreading its radical ideology by force and intimidation including through the regimes military and financial support of Hezbollah and other terrorist enterprises and its collusion with Russia has not gone unnoticed. The United States in concert with our friends and allies in the region must do everything necessary to prevent these territorial ambitions from being realized. If the regime succeeds the strategic implications will be grave and the Middle East is sure to remain a hot spot of instability and conflict for many many more years. The result will be more death and suffering, more destruction, the kind of the regime and its proxies have been inflicting across the region in its fight against Sunni for the West, the ideals of freedom and yes its own people. It will strengthen the regime’s hand in repressing the voice of freedom inside and outside of Iran including through violence like the Evil inflicted on the refugees of Camp Ashraf and Camp Liberty in Iraq, which ultimately resulted in one hundred forty deaths, seven abductions and more than thirteen hundred wounded. This ladies and gentlemen we cannot accept, we must no longer accept it. Passivity and weakness in the face of this tyrannical regime has no place in our policies and in our governments. I will always deeply regret that despite our efforts, the United States did not act with greater speed and commitment on behalf of the Ashraf and liberty refugees. The outrageous delay in coming to their aid resulted in innocent loss of life and frankly I regard the chapter as a glaring and I hope a typical failure in America’s leadership of the international human rights movement, all of this by overwhelming evidence of Iran’s crimes against humanity. As a longtime advocate for their protection and humanitarian resettlement, along with my friends here today, I’m of course relieved that the refugees were finally relocated out of harm’s way to all Albania, obvious too late. The Ministration signing in 2016 was a welcome gesture, but too late. What happened for the preceding eight years when very few effective measures of bringing solace and freedom to these people were advocated? However let’s not kid ourselves the challenges are not relegated to the past, resettlement in Albania and other locations has brought new obstacles. Let me be clear, the international community is deeply grateful to Albania for opening its arms to resettlement, but the Iranian regime has stepped up its presence and plots in Albania and elsewhere hoping to harm these dissidents who wish to see a free Iran. In March Albanian authorities arrested two Iranian agents, we can well imagine from past experience about their designs. Additionally, Albania’s capacity to provide proper care and support is somewhat limited. The population lacks sufficient financial support, health care and proper legal status and it does not yet enjoy the right of a lasting home. For the 1900 refugees there resettled in 2016 as of early 2017, only forty one had achieved proper refugee status, so we must do what’s necessary to ensure that the dissidents having survived the depredations of the regime and its proxies in Iraq, are not made to become subject of the Iranian regime’s proxy in Albania and of course the regime is keeping up its efforts to silence dissidents elsewhere. In June, a terror plot against the annual gathering of the Iranian opposition in Paris was sort of just and in last month, the U.S. law enforcement arrested two Iranian spied surveilling and gathering intelligence on members of a pro-Democracy opposition in this country as Maryam Rajavi pointed out. These are not just some actions of a regime that knows it that is out of step with modernity and fearful of those with a vision and a plan for a better future. As you know I’ve been privileged to be a part of a large group of former and current U.S. civilian and military leaders advocating for their rights and welfare and we will continue to do so. This includes everyone here today at the front table, but I have to say that I’m very proud that also includes the president’s national security adviser John Bolton, who has remained steadfast on his report. You might have noticed that I use that designation “regime” quite deliberately and often I try to never use it interchangeably with the name “Iran”. Iran, after all is a proud and historic culture and society. It’s the homeland of a great and accomplished people and Iran will endure far beyond any regime much less this one that fails to honor its people’s hopes and aspirations. I assure this, with total conviction and the special distinction of belonging at one point, on the regime’s most wanted list, something I consider great honor. I said this with total conviction and the special distinction of being on that list who wouldn’t be a proud to be regarded as an outlaw by the brute mentality that was worked so hard to snuff out reform in Iran? Which has arrested and executed innocent Iranian people for daring to speak out. Which has turned its back on universal pleas for reform and that remains the chief antagonists of democracy and liberalization not just in Iran but everywhere it is struggling to develop. That up, the people of Iran have taken to the streets and what Secretary of State Pompeo has described as quote: “The most enduring and forceful protest since 1979” unquote. In typical fashion, the regime has imprisoned thousands several, dozens have died since these protests began at the beginning of this year, but the repression will not steal the courage and passions of the people demanding the right to liberty and government, and a government worthy of its hopes and dreams and this is why the protests have continued in a very organized way and with clear purpose which is to free the Iranian people. Now as Maryam Rajavi pointed out, we know that Iran is suffering deep economic pain, the Rial has collapsed, inflation has top seventy percent, some will point to the sanctions old and new as the culprit, but ladies and gentlemen the true culprit is the regime that rejects the international norms of behavior, on which orderly relations global trade and economic engagement are based. So I think it’s fair to say the good intentions and an abiding sense of hope was the catalyst for the Iran nuclear deal at its inception, I’ll be it somewhat naive. While the trump’s ministrations the citizen to withdraw the United States from the accord was not without some controversy, I think it was the correct measure. Achieving that vision is deeply rooted in Maryam Rajavi aspiration, this is the core of her ten point plan for Iran’s future. These are Jeffersonian principles that every freedom loving member of the human race can embrace and that every form of tyranny fears. We all know what those ten points are and I will not belabor the point except to say that these ten principles as I refer to them of really truly Jeffersonian principles. This is what the regime fears the most and we look forward with great anticipation to the day when its fears are realized in full. The United States and our allies have a vital role to play in helping shape the kind of free and democratic future that the ten point plan promises. Mankind’s obligation to the people of Iran are far from over. What better place than right here at the U.N. General Assembly week to reflect on these obligations? And to encourage our leaders to embraced in the United States and throughout the world to meet them. Maintain a constant vigorous eye on the regimes activities in the nuclear missile domain. We must remember that the strategic objective is not the imposition of sanctions for sanctions sake, rather it stops Iran from obtaining a nuclear capability, period. We should remain focused on a just outcome in Syria, where a humanitarian tragedy which is sadly fallen out of the news cycle as a key issue. Nothing will strengthen Tehran more than to maintain Syria a proxy. Support the Gulf community and its aspirations to create a defensive alliance to check the regimes existential threat and counter the armed Islamic extremist groups’ supports. Reinvigorate the Middle East peace process. Not the least, to support the Iranian people who hunger for democracy and a government worthy of their hopes and dreams. So that’s the future we’re entering. compliance with their international law, they are numbered because your people will not stop in their demand for a government that reflects their hopes their dreams and their aspirations. Their fulfillment rests on the establishment of united principle courageous and organized civic opposition. One that can touch people’s hearts and minds, one that can harness their passion and conviction to ensure not only that spring returns to Iran, but that spring blossoms into an enduring season of peace and prosperity. That day. That will come soon. Of this I’m certain, that day will come soon, when all Iranians will be set free, when all who were forced to flee their homeland to avoid persecution, will lead a great parade in Tehran to celebrate the triumphant return of a great people for their rightful position, among the family of nations. That is the future we are creating. MEK: The main source of the mullahs’ fear of cyberspace!